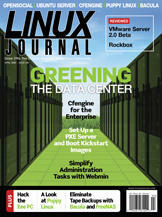 Linux offers you ways to go green and save some green at the same time. How to use cfengine to manage configuration files across large numbers of machines. What if you never had to carry around an install or rescue CD again? Set up a PXE boot server with menus and put them all on the network. New to Linux administration? Webmin can help you out. Lose the tapes. Embrace the disk. Looking for an advanced Web interface, native clients or access through mobiles devices to your groupware platform? SOGo has it all. Several ideas for tweaking your Eee PC. Check out this lightweight distro. Marcel Gagné's Cooking with Linux Happy 100th!